Twice a year, we hold company meetings. These meetings are mandatory and each employee must give a 12-minute presentation on their work and personal status during the prior six months. The primary purpose of the meeting is to improve teamwork and communication, which can be a challenge in a work-at-home company. This spring, we were in Nashville, TN, Music City. For lunch and dinner, employees are assigned a random group of coworkers. Last evening, the company converged at the hotel bar before separating into our random groups. It was easy to spot us, because our employees, while traveling, wear PC Matic apparel. At the bar, a Philadelphia man, his wife, daughter, and granddaughter, were enjoying some of the ubiquitous Nashville live music. He noticed me, smiled and shook my hand. “Windows is a sieve, and your company fixed it. Thank you. I am amazed at what you have accomplished,” he exclaimed. He maintained eye contact and his enthusiastic praise. “Thank you so much,” I blushed in a failed attempt to deflect. His daughter intervened, and apologized. “No apologies necessary,” I grinned. We took a selfie, and I returned to talking to my coworkers. I later learned that he approached a half dozen other employees with similar accolades. The man and his family are some of the millions of PC Matic customers. Thank you! I travel frequently for work, and I proudly sport a shirt with the PC Matic green shield. I can walk the airports and public spaces because I know that our customers do not get infected. The white list works and it is made in America. Earlier this year, I met another PC Matic customer in Alpharetta, Georgia, Jeff Gaynor. Mr. Gaynor spent his entire career in public service, first in the military and later focused on the security of our nation’s infrastructure. Jeff was the CEO of InfraGard, a 50,000 strong group of professionals, dedicated to preventing hostile acts against the United States including cyber attacks. In his retirement, he is CEO of American Resilience, a non-profit focused on educating Congress to the severe consequences of a successful cyber attack to the federal government. I was in Greenville, SC, as the news of a successful ransomware breach to the city of Atlanta unfolded. The first person I called was Jeff Gaynor. “It’s going to escalate,” he presciently whispered. Later that day, the mayor, with that deer-in-the-headlights look, warned the public that the breach could expose all citizens’ bank and personal information. It was indeed escalating. Modern ransomware encrypts and cripples digital infrastructure, but it does not steal. At least, not yet. Later, the city of Atlanta turned off the airport wifi service, and moved the police to paper tickets. As of this writing, three weeks after the breach, the city of Atlanta still has not returned to normal operations. For me, Atlanta is a wake up all. Our technologies are newer, made in America and our customers do not get infected. The massive security hole is our continued reliance on archaic black list security products. We need to deliver our message more forcefully and aggressively until white list security changes the fabric of our nation’s infrastructure. One final note. Thank you to all of our loyal customers. You have chosen the best antivirus and more importantly, you have chosen not to be infected. For access to the full Q1 2018 newsletter, click here. 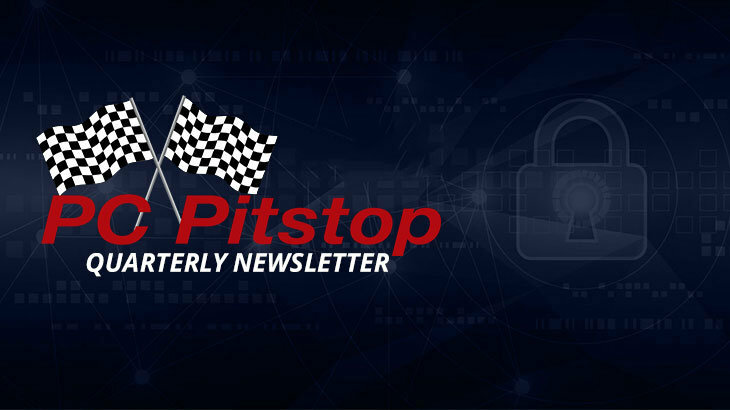 Q1 2018 Newsletter ceo, PC Pitstop, Q1 2018 newsletter. permalink. The PC Pitstop Team is Growing!